I decided late on the Sunday night to travel down to the infamous Longshoot hotel for some craic with the lads as I thought it would be better than having to get up really early on Monday morning and battle the thousands of commuters from Teesside to Leicester. 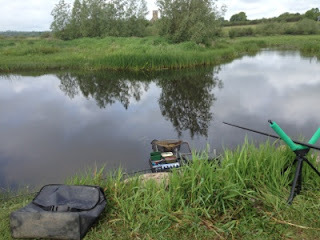 Day 6, our final day's fishing in Ireland and the group had agreed to go back to the cut at Trinity Lake. We arrived with only a few people on the bank up to the far end, so we easily fitted in our 6 pegs together. I drew a peg one down from my previous experience on the Cut and knew exactly how to fish it. Pole only today, just as previously, so it was 12 metres of pole coupled with a very light float to trot down the swim and fish shallow. Feeding cast and trotting the float down the swim it took some time before the first fish was in the net. In the meantime, both Paul and Fred (who was my partner for the day) were soon ahead of me. Paul's fish were of good quality. Eventually my fish started to come, but they were definitely smaller than those Paul was getting and so started a great battle for honours between myself and Paul. Today would decide the champion with Paul needing to finish two places higher for a win, or one place higher for a draw.